It's not just in the Premier League where potential foreign buyers are looking to invest in English football. According to the Stoke Sentinel ,League 1 Port Vale has attracted interest from an American consortium. It is understood they are among three separate potential buyers who have discussed a price with the chairman, Norman Smurthwaite and are studying the club's finances before making a final offer. However, a fourth interested party is considered unlikely to come up with an acceptable offer. It is understood the American consortium, who have a background in sport but not soccer, are regarded as a serious contender by Smurthwaite and want to buy both the football club and Vale Park. However, he has sought to reassure those supporters who are concerned that Vale will no longer own their own ground. 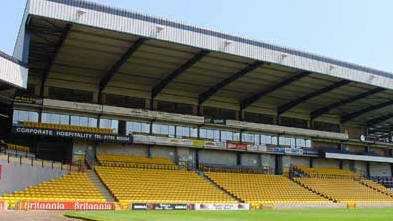 They fear the Valiants could eventually suffer like Coventry City, who didn't own their own stadium and moved out to play at Northampton for more than a year after a dispute with the landlords. Smurthwaite says he will remain owner of Vale Park if necessary, but says the new owners of the football club would have the security of a minimum 25-year lease at Vale Park at a fixed rent. He said: "If the status changes between the ownership of the club and freehold then it automatically triggers a 25-year lease which I am trying to extend to 30 years with the Football League as we speak. "That is at a fixed rent which is way below market rent. If a person comes and buys the football club, but doesn't have the means to buy the stadium, they will be given an option of five years to buy the stadium at a fixed price now. "Ideally a purchaser will buy both but, as I am still going to be coming to the games after I have sold the club, I will make sure I have the most comfortable seat! "Quite a lot of football clubs have this arrangement. We will never see a Coventry City at Port Vale, not whilst I am involved and have any influence and control. "I have seen a lot of mistakes that clubs have made, including Coventry City, and I will never allow that to happen here." Smurthwaite, who has been in charge since 2012, expects to sell the club by the end of the season, but will only sell to a buyer he believes will make a success of running the club. He added: "There are four parties, of which three are serious contenders. One I wouldn't consider as serious. Out of the three there is a price which I have dictated to all of them and it is non-negotiable. All of them are continuing with the dialogue so they are happy with the price, or as happy as you can be in you are buying an asset. "I want the club to continue to prosper. The club is in a better place now than when I bought it and I will make sure the next custodian has the facilities and ability to make it even better than when I leave." The chairman publicly put the club up for sale in December. If he doesn't sell before the end of the season, then he will appoint a chief executive to run it. However, he expects to agree a sale and says he will be happy to advise new owners, having himself been grateful to former chairman Bill Bell for advice three years ago. Smurthwaite added: "There are parties doing their due-diligence as we speak. In the event that any of them eventually find they haven't got the means or choose not to buy the club, then, as I have said before, I will appoint a CEO. "There will be no instability in the handover. I am still coming here. When I took day to day control I spent a lot of time with Bill Bell trying to understand Port Vale, its people and its challenges. Sadly, Bill didn't live long enough to give me the full picture but he gave me a flavour for what was coming ahead."